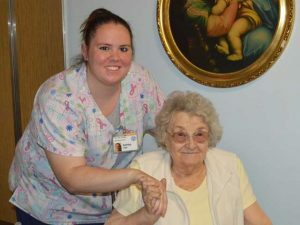 Each day, Vehrs assists residents of the B2 wing with their daily routine. She helps them get ready to start their day, checks their vitals, aids with their basic needs and stops by to check on them hourly to make sure they are doing well. Enhance your quality of living and enjoy Our Lady of Angels, a resident-centered, retirement home community providing high-quality care and rehabilitation services for seniors. A welcoming staff awaits perspective seniors and their families. Call and schedule a tour today. To speak directly with OLA’s Admissions Coordinator regarding what level of care is best for you or your loved one, call 815-725-6631 ext. 4113.